From the fires of a Gypsy camp, come the curses and stories of this horror/whore named Roo. She can’t shake the ghost, who pines for Alice White. She wants to pluck the eyes of Louis Marvin, and use them as olives in a martini. www.roobardookie.com. Roo’s micro Cannibal School: Picking up Johnny appears in the August 2013 issue of HelloHorror, her micro Saint No. 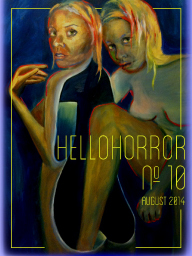 2 appears in the October 2013 issue of HelloHorror and her micro, Saint No. 1 appears in the December 2013 issue of HelloHorror. Louis Marvin is Roo Bardookie's former lover. She works with him, while harboring ideas of taking him in a time machine to suffer the deaths of the damned with De Sade, Bathory, Hitler and Spanish Inquisitions. He has been published here and there, and read a poem where the Gin Blossoms began their rock career in Tempe, Arizona.